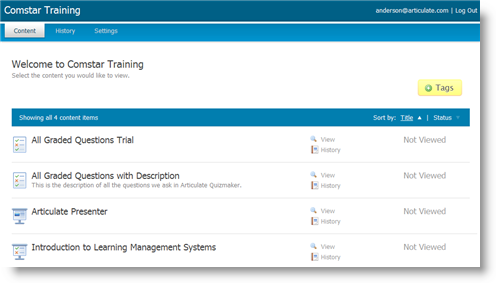 The Articulate Online User Portal lets your private users securely login to a personalized training site to access all content items that have been assigned to them. Learners access the User Portal by visiting your site's URL. This is the same URL you use to login to your account as an administrator or publisher. Enable User Portal: Mark this box to let private users login to your User Portal. Show public content items: Mark this box to include public content items in the User Portal. 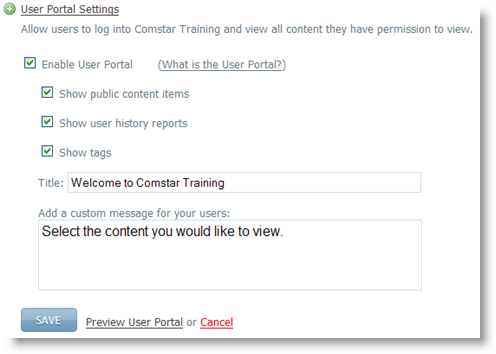 If you uncheck it, learners will only see private content items that you've granted them permission to view. Show user history reports: Mark this box to let learners run reports on their content items. Show tags: Mark this box to display tags you've assigned to content items, so learners can filter their content list. Hide change email and password options in user portal: Mark this box, if you'd prefer not to give learners the option to change their email addresses and passwords. Title: Enter the title you want learners to see when they login to your User Portal. Message: Enter instructions or a message for learners. They'll see it when they login to your User Portal.